Extra parts have been added to this kit in order to get better coverage. Watch a video about this carburetor kit. BE SURE TO VERIFY YOUR CARB NUMBER. Carter BBD rebuild kit, made in the USA from high quality ethanol ready parts. Everything shown in the photo is included in the kit, additional parts may be purchased by choosing your carburetor type in our main catalog. For additional help including rebuild videos, free manuals, and troubleshooting, please see our technical section. 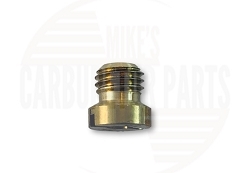 I was impressed with mikescarb.com, because of of his user friendly web site. It was easy to locate the exact rebuild kit because they show what you are getting in every kit through a parts video. They also provide technical support if needed. I also thought the price was very reasonable. A couple days later I received my kit.Rebuilt the carb, and my truck runs great! 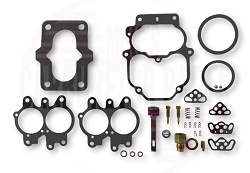 Nice complete kit, gaskets are excellent quality and fit perfect. Parts are identical to OEM. This carb kit appears to be correct as I have reviewed all the gaskets. 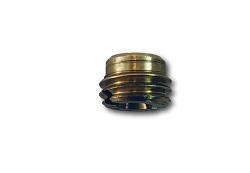 I am very happy with the service and product. Haven't rebuilt carb yet. I'd be happy to do business again. The kit came fairly quickly and with everything that was expected. Unfortunately it did not include two small washers that fit under the main jets. These washers were deteriorated in my carb and I was forced to source them from another supplier which ended up costing almost as much (with shipping) as this kit and delaying my rebuild by about a week. I'd strongly suggest including these washers in the future, and have removed a star for this reason only. Otherwise I am pleased with the kit and service. This kit worked great. Would buy from this company again. Kit arrived quickly and as described. No surprises just a well made kit with everything I needed and everything fit perfectly. 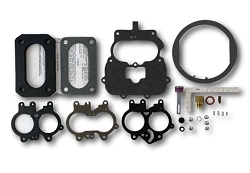 Q: Will this kit work for carter carburetor #4821S? Or do I have to specify my carb #? Q: Does this fit carb # 0383 4947S ? Q: I have 2 Carter rebuilt carbs that have the numbers 0-2258 on one and 0-2074 on the other. Both are two barrel and both have been used on my 1971 Plymouth Duster with a 318. Will this kit work on these carbs? A: Those are casting numbers, I can't use them to cross kits. You are looking for a four digit number with an "s" at the end. You can see examples on the 'application/carb number' tab.